LOS ANGELES The big deal for Hollywood is not the record $10.8 billion that studios took in domestically in 2012. It's the fact that the number of tickets sold went up for the first time in three years. Thanks to inflation, revenue generally rises in Hollywood as admission prices climb each year. The real story is told in tickets, whose sales have been on a general decline for a decade, bottoming out in 2011 at 1.29 billion, their lowest level since 1995. The industry rebounded this year, with ticket sales projected to rise 5.6 percent, to 1.36 billion, by Dec. 31, according to box-office tracker Hollywood.com. That's still well below the modern peak of 1.6 billion tickets sold in 2002, but in an age of cozy home theater setups and endless entertainment gadgets, studio executives consider it a triumph that they were able to put more butts in cinema seats this year than last. "It is a victory, ultimately," said Don Harris, head of distribution at Paramount Pictures. "If we deliver the product as an industry that people want, they will want to get out there. Even though you can sit at home and watch something on your large screen in high-def, people want to get out." Domestic revenue should finish up nearly 6 percent from 2011's $10.2 billion and top Hollywood's previous high of $10.6 billion set in 2009. 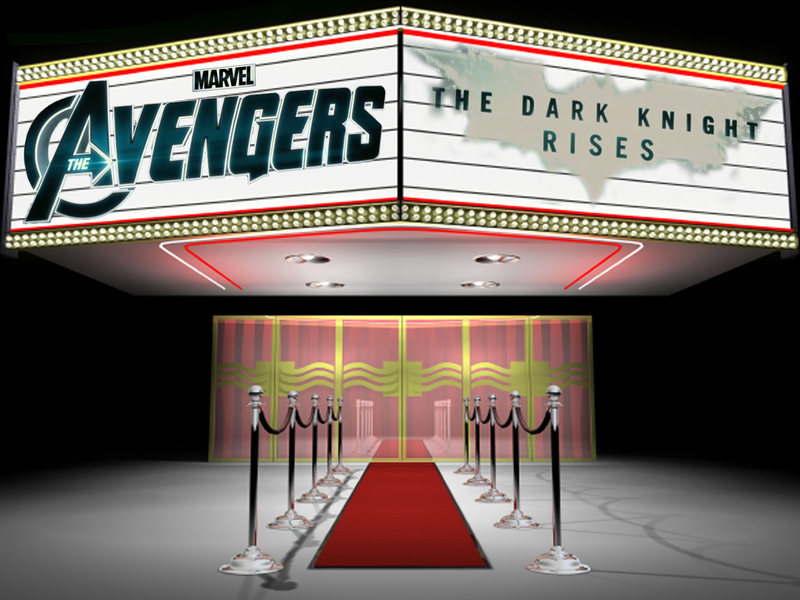 The year was led by a pair of superhero sagas, Disney's "The Avengers," with $623 million domestically and $1.5 billion worldwide and the Warner Bros. Batman finale "The Dark Knight Rises," with $448 million domestically and $1.1 billion worldwide. Sony's James Bond adventure "Skyfall" is closing in on the $1 billion mark globally, and the list of action and family-film blockbusters includes "The Hunger Games," "The Twilight Saga: Breaking Dawn  Part Two," "Ice Age: Continental Drift," "Madagascar 3: Europe's Most Wanted," "The Amazing Spider-Man" and "Brave." Before television, movies were the biggest thing going, with ticket sales estimated as high as 4 billion a year domestically in the 1930s and '40s. Movie-going eroded steadily through the 1970s as people stayed home with their small screens. The rise of videotape in the 1980s further cut into business, followed by DVDs in the `90s and big, cheap flat-screen TVs in recent years. Today's video games, mobile phones and other portable devices also offer easy options to tramping out to a movie theater. It's all been a steady drain on cinema business, and cynics repeatedly predict the eventual demise of movie theaters. Yet Hollywood fights back with new technology of its own, from digital 3-D to booming surround-sound to the clarity of images projected at high-frame rates, which is being tested now with "The Lord of the Rings" prelude "The Hobbit: An Unexpected Journey," shown in select theaters at 48 frames a second, double the standard speed. For all of the annoyances of theaters -- parking, pricy concessions, sitting next to strangers texting on their iPhones -- cinemas still offer the biggest and best way to see a movie. "Every home has a kitchen, but you can't get into a good restaurant on Saturday night," said Dan Fellman, head of distribution for Warner Bros. "People want to escape. That's the nature of society. The adult population just is not going to sit home seven days a week, even though they have technology in their home that's certainly an improvement over what it was 10 years ago. People want to get out of the house, and no matter what they throw in the face of theatrical exhibition, it continues to perform at a strong level." Even real-life violence at the movie theater didn't turn audiences away. Some moviegoers thought twice about heading to the cinema after a gunman killed 12 people and injured 58 at a screening of "The Dark Knight Rises" in Colorado last summer, but if there was any lull in attendance, it was slight and temporary. Ticket sales went on a tear for most of the fall. While domestic revenues inch upward most years largely because of inflation, the real growth areas have been overseas, where more and more fans are eager for the next Hollywood blockbuster. Rentrak, which compiles international box office data, expects 2012's foreign gross to be about $23 billion, 3 percent higher than in 2011. No data was yet available on the number of tickets sold overseas this past year. International business generally used to account for less than half of a studio film's overall receipts. Films now often do two or even three times as much business overseas as they do domestically. Some movies that were duds with U.S. audiences, such as "Battleship" and "John Carter," can wind up being $200 million hits with overseas crowds. Whether finishing a good year or a bad one, Hollywood executives always look ahead to better days, insisting that the next crop of blockbusters will be bigger than ever. The same goes this time as studio bosses hype their 2013 lineup, which includes the latest "Iron Man," "Star Trek," "Hunger Games" and "Thor" installments, the Superman tale "Man of Steel" and the second chapter in "The Hobbit" trilogy. Twelve months from now, they hope to be talking about another revenue record topping this year's $10.8 billion. "I've been saying we're going to hit that $11 billion level for about three years now," said Paul Dergarabedian, a box-office analyst for Hollywood.com. "Next year I think is the year we actually do it."